“A strict allegory is like a puzzle with a solution: a great romance is like a flower whose smell reminds you of something you can’t quite place. I think the something is ‘the whole quality of life as we actually experience it.’ You can have a realistic story in which all the things & people are exactly like those we meet in real life, but the quality, the feel or texture or smell, of it is not. A good, true “romance” in the literary sense is a story that doesn’t relate to, or teach a clear “lesson” about, life as we know it in a strict “this represents that” sense. But in the telling of the story, and the development of the characters, it feels like real life. It stirs your affections, awakening pleasure and sorrow and fear and joy. You see much that is applicable, as Tolkien talked about, to real life as we all live within the great Story (capital “S”) that the Creator is telling. And in being this way, a romance is filled with Truth, of echoes and emotions that remind us of our true country. The “quality and texture” is there, and is realistic. The Lord of the Rings is filled with more truth than I’ve experienced in lots of other books, though it’s not an allegory. We don’t need it to be. And the things a story like that stirs in us are possibly more real and rich as a result. It’s good to read books that have these qualities, because they wake us up, I think, to truer feelings, which all point to the new heavens and earth that are coming. When things will be the way they were meant to be in the first place. We only glimpse it now, but reading the right kinds of books can shape us into the right sort of people, who desire and feel for the right sort of things. This is really a great lecture. Kreeft’s insights into The Lord of the Rings are right-on, and I especially enjoyed this because I wrote a senior thesis paper on this subject matter in college. If you’ve never heard some of this, it’ll give you a deeper appreciation for what Tolkien was up to in his writing. Peter Kreeft is the author of The Philosophy of Tolkien, where you’ll get more of these insights, in greater detail and depth. “All of summer stretched out before me: a vast, unexplored adventure. In my arms, I held a package my uncle had given me several weeks before. On the brown wrapping, Uncle Frank had written his instructions: ‘Do not open until summer vacation.” My uncle had sent me the greatest of all gifts: three brand-new Hardy Boys books. My wife and I have had a problem the last couple years with It’s a Wonderful Life. We’ve been watching it as a Christmas tradition. We do love the movie – it’s just great – but what keeps bothering us about the story is that Mr. Potter does a pretty heinous thing, for which he receives no justice, in what we see of the story anyway. Here’s what happens if you recall: Mr. Potter wants to take control of the Building and Loan, run by George Bailey. Potter tries everything, even hiring George with the promise of much higher pay, to acquire George’s family business and control over the banking and real estate of the town of Bedford Falls. Having tried everything else, Potter swipes an envelope of cash meant to be deposited by the building and loan, putting George and his company at great risk, and starting the tragic trajectory of events the movie is famous for. 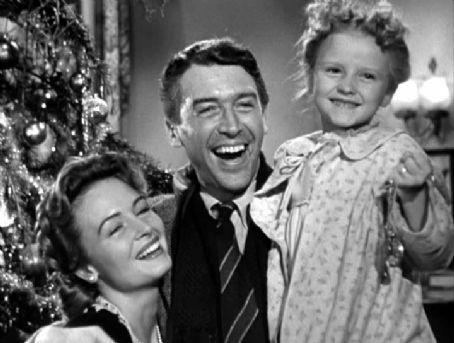 George tries to find the money to no avail, which leads him to lash out uncharacteristically in anger at his family that night, and leads him out to the bridge in the snowstorm where he’s saved from suicide by Clarence the angel, and is given a chance to see what his life and everyone in it would be like without George Bailey. And on and on it goes, but the seemingly terrible thing about it if your paying attention, is that no justice ever befalls Mr. Potter for his terrible crime against George. George hurts his family, and almost kills himself over this whole mess, which is all Potter’s fault. And no admission, no repentance, no final reckoning in the story for him at all. But I say “if you’re paying attention” for a reason. By the end, when George is given his life back, and he’s realized how good he has it with such friends and family, we’ve all but forgotten about Potter and what he did to George. Potter’s crime becomes overshadowed by the grace and love that come to George in the end. Here’s what’s so cool about this film. In spite of the weird theology, or what I guess is really angelology, there’s a deep sense of the triumph of true goodness and love over any wrongs ever done to us in this life. The goodness at the end of the story, and the profound, self-forgetful love shown to George matters far more than the injustice done against him. But old Mr. Potter recedes down and away into his self-made loneliness and misery, a recession that’s mirrored in the last scene of Potter in the film. In that scene we see Potter peering miserably out of his window at George searching the snowy street for the lost money, trying to right the wrong he didn’t even commit. Contrast this with how George’s burdens are borne upward by the love and kindness of his friends. In kind of a Pauline sense, death is swallowed up in victory; miserable avarice is swallowed up in great joyousness. There’s not much of Christ in this story, but we feel some deeply Christian things here even so.